Data masking for IBM DB2 enables to protect sensitive and regulated data in production databases from hacker attacks, insider threats, and unintentional data leaks. The original data is transformed into realistic-looking data with random or set characters. The data masking solution prevents exposure of critical data to unauthorized users. 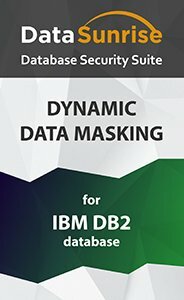 IBM DB2 Data Masking tool allows organizations to prevent sensitive and regulated data exposure to unauthorized users. It is appropriate to obfuscate data when a database is processed by a third-party or when it is necessary to limit employees’ access to the production database, so that developers, testers, analysts could work with realistically looking data without ever gaining access to real data. In most of the cases, third-party developers don’t need actual data to fulfill their responsibilities – it is enough to provide them with an environment mimicking the real production database. IBM DB2 Data Masking is the right tool for this purpose. It is important that the structure of masked data is preserved to support proper functioning of the third-party applications. The point is to make the data useless for evil-doers while keeping it usable for the users that process it. DataSunrise provides both dynamic and static data masking. Static data masking allows users to create a standalone copy of a real database with neutral data instead of confidential data. With dynamic data masking, sensitive information is obfuscated at the time of a query, before being transferred to a third party. In such case, the actual database content remains intact and only database output is obfuscated. DataSunrise provides masking algorithms for credit card numbers, dates, emails, time periods, etc. Users can also create their own algorithms.